Pretend you’re a convicted felon. You’ve just been released. You’ve picked up your sparse belongings, and a tattooed thirty-something named Fuzz Nectar is waiting for you beyond the prison gates. His maroon, racing-striped Civic burps NOS-infused exhaust. It’s late October in Maine and the trees look like bug carcasses planted head-first. You bump fists with F.N. and he asks where to. You pull a five-year old cigarette from a case of Marlboro blacks, light it with an MMA-themed Bic and take a deep drag. The smoke brings your voice an octave lower and pleasantly stings your nostrils as you say “Maine Diner,” to the hastening western breeze. Suffice it to say, you and Fuzzington McKnuckleburg are about to get belly swole. Maine Diner feels like your grandma’s house: the nice one. The waitresses dote on you. Your water is full before your cheeks meet the seat. Not only is the menu at the table, the place mats are also menus. For forty bucks, you could eat like Olde English royalty. You’re surrounded by men who look like they’re carrying triplets, and women who actually are. There are at least three people over the age of 100. And this is not only good, but right. Deeply right. Fazz Nnnnectarino orders a coffee and a homemade pecan pie (Tricia [the wife] made him rock-hard scrambled eggs right before he picked you up). You order the Jim Nantz: a meal so unholy, like Voldemort, it’s broken into parts that -- initially -- must not be named. 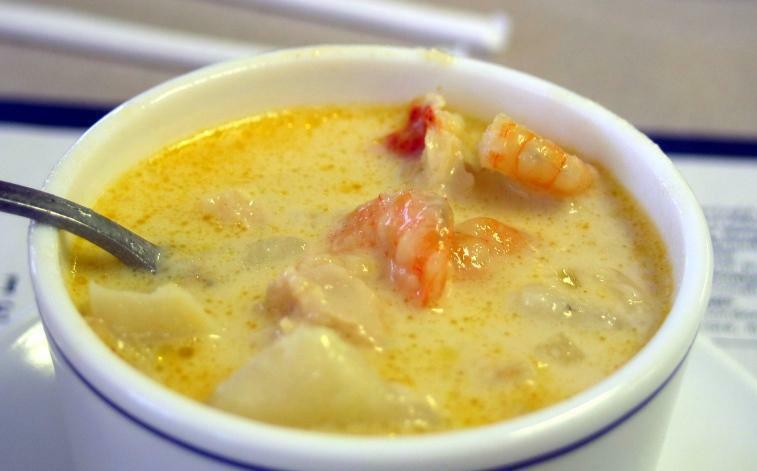 It features the combo of Maine Diner’s 7-years-in-a-ding-dang-row award-winning seafood chowder. You, like the pro you are, do not make the mistake of ordering the clam chowder, which is a fine treat, but contains nowhere near the culinary, concussive force of the one and only Seafoo Chow. The second part of the Jim Nantz is the choice of a cold or warm lobster roll. Oops, did I say lobster roll? I meant Liggity-iggity-izobster Riggity-ricky-ticky-tick-tock-tavvy-rizoolio. You get the lobster roll cold with drawn butter on the side. Homemade Cole Slaw? A-hyes-pulleaze. Your stomach is licking its lips. And no, that’s not gross to contemplate, it’s transcendent. The place is packed and its a Wednesday at two forty five. This is a diner where tourists feel like locals and locals feel like family. The decor is spartan. The tabletops appear to be linoleum. The ambience is part nostalgia-drenched Americana, part back-country cafeteria, part perfect. The food is gone before it hits the table. Professor Fuzzlebung burps pecan. You lean back and smack your lips. Maine Diner is not a diner, as its chosen title would have you believe. It is both Maine and Diner incarnate. Where lobster and a snow-white ethnic landscape meet a quintessential, neckfat-producing, stick-to-your-guts-style dinerfeast. Corporal Fussy Neck-tar pays for the whole deal (it’s your big day bra), and again he asks where to. You tell him to take you to Pam’s, where a 4.5 year old son whose hand you’ve only touched through an inch of prison glass awaits. The sun sneaks from behind a cloud and you light up another twig. Today is a good day. 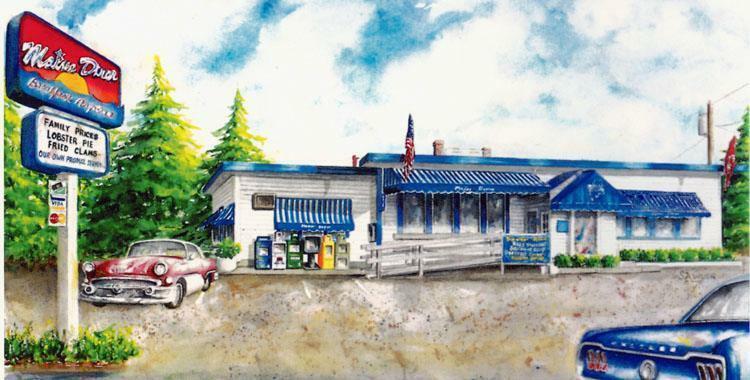 Life doesn’t begin at conception; it begins at Maine Diner. Everything you want from a diner (homemade hashes, homemade pancakes, homemade everydingle) and lobster. Stuff yourself for under $10. Get a dinner that’s better than a warm hug from Mom for under $20. Or, man up and get seafood chowder, a lobster roll, a slice of warm blueberry pie (a la mode 4sho), and wash it all down with some crude (aka diner coffee) for about $30. Just perfection. More American than Uncle Sam snorting a piping slice of apple pie from the Statue of Liberty’s cleavage. Attentive service that reinforces the obvious: they care about getting you fed. If you are a person and you are alive you should find a way to eat at Maine Diner.